ABOVE: A close-up of the Belvedere's arcaded walkway. At 78 meters or 256 feet above sea level, the Pfingstberg is the highest hill in Potsdam, Germany. Its Belvedere, a collection of cloistered viewing promenades and towers in Italianate style, was begun in 1847 during the reign of Kaiser Friedrich Wilhelm I. It wasn't completed until 1863. Over the years, the Belvedere fell victim to decay and vandalism. Potsdam citizens began restoring the monument under the auspices of the GDR's Cultural Association in 1987. In June, 1989, the first "Pfingstbergfest" or Pfingstberg Festival attracted more than 1,000 people. After repairs, the Belvedere reopened in 2001 and was completely restored by 2005. Today, more than 100,000 Potsdamers and visitors climb the Belvedere's towers every year, enjoying panoramic views and cultural events such as concerts, theatrical productions, and exhibitions. The Förderverein Pfingstberg (Pfingstberg Support Association) also rents the Belvedere out for weddings and receptions, and it offers public "moonlit night" visits and illuminations from spring through fall. The Pfingstberg Belvedere stands in an English-style park north of the city center. It's easy to reach by tram, bus, or car--or even on foot, if you're staying in the New Garden district (see my article on the Relaxa Schlosshotel Celienhof) or don't mind a hike. Ticket prices are reasonable, and there's even an inexpensive "family card" for two adults and up to three children. 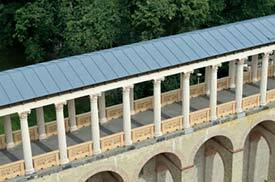 To learn more about the Belvedere and its surroundings in English, visit the support association's Pfingstberg Potsdam site. And to view our captioned photos of the Pfingstberg Belvedere, see page 2 of this article. Photo copyright © Antonio d'Albalore.